Some Republicans have taken note. 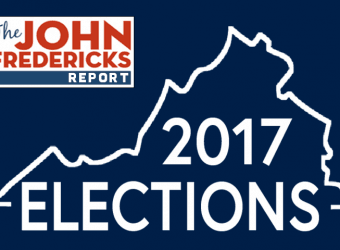 John Fredericks, a conservative radio host who helped run Trump’s presidential campaign in Virginia last year, has become a grudging McAuliffe fan. He has praised the governor for his economic development efforts and conceded that McAuliffe’s push to unlock federal dollars by expanding Medicaid, which the Republican-controlled General Assembly has so far resisted, was probably the right call. “He would be the one to bring the working-class jobs debate to Trump’s base and make the argument that he could peel some of it away in the battleground working-class swing states,” Fredericks said. 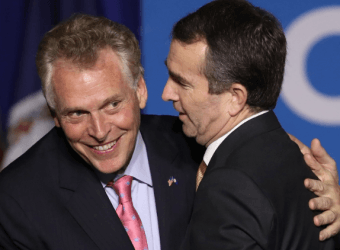 “I fear Terry McAuliffe more than any other candidate in the Democratic field in 2020. Few others will go that far, but after last Tuesday’s strong showing, McAuliffe has at least earned mentions in the chatter about presidential contenders. Read the full article McAuliffe may be on his way out in Va., but nationally he’s just arriving from The Washington Post. Martha Boneta, a Paris farm owner and popular figure in conservative Republican circles, announced on a radio show last week she will run to fill the unexpired state Senate term of Jill Holtzman Vogel if Vogel is elected lieutenant governor on Nov. 7. 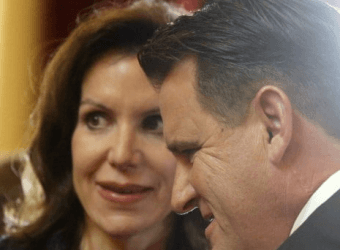 Should Vogel lose, Boneta said she won’t run against Vogel in the 2019 election if she is seeks re-election to a full four-year term because “she is doing a fine job” representing the people in the 27th District. Boneta’s comments were made during an interview Friday on the John Fredericks Show, a radio program. She told Fredericks and his audience that it was “absolutely true” she will run for the state Senate seat if it becomes vacant. “I love Virginia will all my heart. It’s where I was raised and where my friends raised their families. To have the opportunity to serve the people of Virginia in the 27th is something I would be honored and privileged to do. It would be a privilege to wake up and serve,” Boneta said. Boneta hosted then vice presidential candidate Mike Pence and Virginia Republican candidates on the ballot at an event on her farm in September 2016. Boneta said the head of President Trump’s election operation in Virginia is advising her nascent campaign. The 27th Senate District consists of all of Fauquier, Clarke and Frederick counties, all of the city of Winchester, and parts of Culpeper, Loudoun and Stafford counties. Read the full report from the Fauquier Times. One of President Trump’s most fervent fans hopped onto his Harley in South Carolina and roared all the way to Virginia Beach, where he led a “Bikers for Trump” rally Sunday for Virginia gubernatorial candidate Ed Gillespie. Except Gillespie wasn’t there, irking some Trump supporters who say the Republican has been too standoffish toward the president. 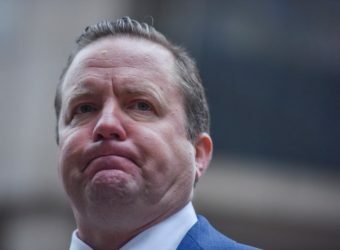 But Corey Stewart, a Trump acolyte who nearly beat Gillespie in the June gubernatorial primary, was front and center and gave the crowd the blunt, populist rhetoric it craved. 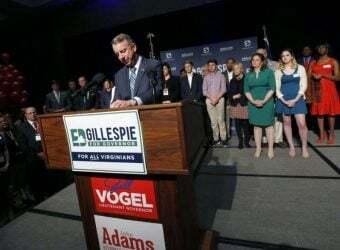 Two-thirds of the Republican ticket — state Sen. Jill Vogel, who’s running for lieutenant governor, and lawyer John Adams, candidate for attorney general — traveled to Virginia Beach for the event, although Adams had to leave before it began because his father fell ill.
Gillespie was about 200 miles away, in Arlington, appearing with Sen. Rob Portman (R-Ohio). Forces loyal to Trump are trying to pull Gillespie over the finish line Nov. 7 in what polls say is a tight race against Lt. Gov. Ralph Northam (D). They fear that a GOP loss in the nation’s only competitive governor’s race would be widely read as a rebuke to Trump — a potentially damaging narrative heading into 2018’s congressional midterms. Trump allies, including Bikers for Trump founder Chris Cox, have decided such a situation warrants doing for Gillespie what he won’t do for himself. And on Sunday, that meant delivering red-meat speeches to people who helped put Trump in the White House. Cox plans to hold another rally this weekend in Roanoke. 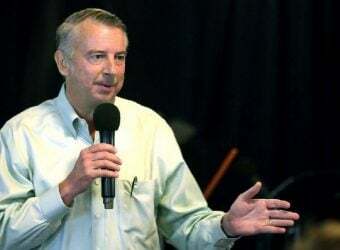 A former Republican National Committee chairman, Washington lobbyist and adviser to President George W. Bush, Gillespie has struggled to strike the right posture toward Trump. In a purple state that gave Hillary Clinton her only Southern victory last year, Gillespie needs to excite rural Trump supporters without turning off moderates and inflaming Democrats in the state’s deep-blue population centers. He has tried to avoid weighing in on Trump’s policies and tweets. When Trump surprised Gillespie with a tweeted endorsement Oct. 6, Gillespie did not even retweet it. But in the final weeks of the campaign, Gillespie has been running hard-edge ads against illegal immigration and in favor of Confederate statues. Stewart, who is chairman of the Prince William Board of County Supervisors and who ran Trump’s Virginia campaign for much of last year’s race, declined to endorse Gillespie after their bitter primary battle. Stewart recently tried to patch things up at the urging of former White House chief strategist Stephen K. Bannon and Trump’s former deputy campaign manager, David N. Bossie. Gillespie rebuffed Stewart’s offer to rally with him, so Stewart decided to hold an event without him. He also hosted Vogel as the special guest of his annual fall family fundraiser at his Prince William home Saturday. 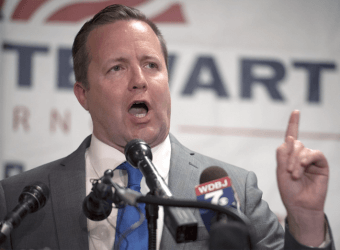 Before a crowd of about 200 people at Rock Church in Virginia Beach on Sunday, Stewart called Kaine a “far-left-wing lunatic.” He called state Attorney General Mark Herring (D) a “schmuck” and a “scumbag,” eliciting cheers from the crowd. Stewart noted that state Del. Robert G. Marshall (R-Prince William) has a transgender opponent, Danica Roem. “He was Dan Roem. Now it’s Danica Roem. Not that there’s anything wrong with that,” he said to laughs. Stewart ridiculed plans by elected leaders in the District to raise a statue to former mayor Marion ­Barry. Vogel, a former chief counsel to the Republican National Committee, gave a spirited speech in defense of Confederate monuments, smaller government and lower taxes. She faces former federal prosector Justin Fairfax (D). Adams is challenging Herring, who is running for reelection. Gillespie’s absence went unmentioned, but it was fodder for political talk radio during the lead-up. “Once again, if Trump’s name is on something, Ed Gillespie — nowhere to be found,” conservative radio host John Fredericks said in an interview with Cox a few days before the rally. 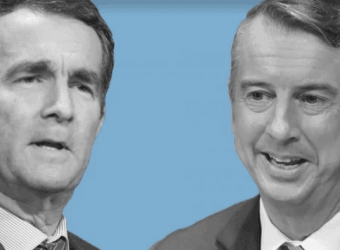 Cox initially suggested he was working with the Gillespie camp to geographically “divide and conquer,” with the bikers’ event in Virginia Beach freeing Gillespie to round up votes in other parts of the state. But when Fredericks dismissed that as a “politically correct” response, Cox conceded. “Quite frankly, I’m here for my president,” he said. “Unfortunately, Ed has stepped away, and it’s not going to help him, in my opinion, the stepping away from these Trump supporters. . . . All we can do is keep our eye on the ball. We’ve got to stay positive. If we start criticizing things and not feeling good about the situation, it may hurt the voter turnout. The rally is only the latest effort by prominent Trump allies to give Gillespie a boost, whether he welcomes it or not. The website Breitbart, which Bannon leads, championed Gillespie as a “culture warrior” this month for saying he thinks Confederate monuments ought to remain in place. Northam has said they belong in museums. Both men concede that in most cases, local officials appear to have authority over monuments. Meanwhile, dozens of Trump’s 2016 campaign aides are working to get disaffected blue-collar rural Virginians to vote in the race — an effort seen as a trial run for a national push in next year’s congressional midterms. Look Ahead America is targeting 12,000 registered voters who have not been to the polls since 2009, the last year Republicans won statewide elections in Virginia. 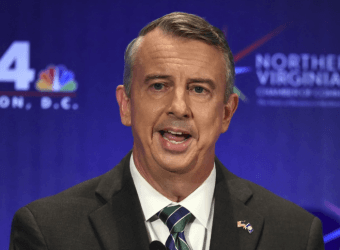 The group is conservative but officially nonpartisan, so it cannot directly urge voters to choose Gillespie. President Trump has been a presence in Virginia’s contest for governor since before the candidates were even set, but he has now roiled the race by jumping in directly and attacking the Democratic nominee through his preferred method: a nighttime tweet. “Ralph Northam, who is running for Governor of Virginia, is fighting for the violent MS-13 killer gangs & sanctuary cities. Vote Ed Gillespie!” Trump tweeted to his 40 million followers at 9:58 p.m. Thursday. Virginia’s Republican nominee for governor Ed Gillespie is keeping President Trump at arm’s length, suggesting he views him as a liability in his campaign against Democratic Lt. Gov. Ralph Northam. Trump, in an unexpected Thursday evening tweet, urged Virginians to vote for Gillespie on Nov. 7, while charging that Northam was soft on gang violence. Gillespie welcomed the president’s get-tough-on-crime message, but didn’t have much to say about Trump himself.